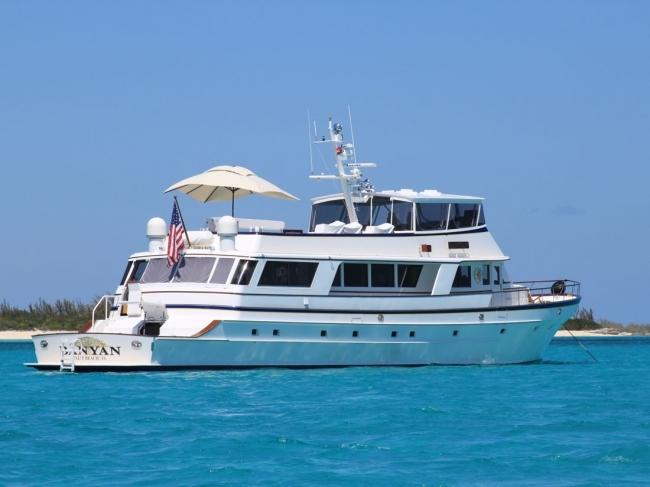 Book either December 18-25, 2012 or January 5-12, 2013 in Nassau at the Special Holiday Rate of $27,000/wk + expenses with the 37' Intrepid included and no delivery fees! Banyan’s 2009 and 2010 refits created accommodations area of unmatched comfort. Elegant fabric wall coverings, a soft color scheme and onyx countertops impart a welcoming island cottage ambiance. The Master Stateroom is full beam with a king bed and surrounded by enough storage and closet space to support the needs of the most fashion-forward cruiser. Natural light spills through the shoji screens, augmented by a sophisticated lighting plan including thoughtful reading lamps. Among the suite’s amenities are his and hers bathrooms, flat screen TV, DVD player, and surround sound with Bose acoustic noise cancelling headphones. The newly remodeled VIP guest suite to starboard features a queen bed, complete audio/visual entertainment systems with flat screen TV/DVD and Bose acoustic noise canceling headphones. A twin guest suite to port features complete audio/visual entertainment systems with flat screen TV/DVD and Bose acoustic noise canceling headphones. Pullman berths in each guest suite provide additional accommodation suitable for children. These suites each have a unique island-influenced color scheme. Highest quality mattresses and linens, plus beautifully appointed large bathrooms.